Fee: $25/$20 members (all materials included). Price is per set of blocks. Registration: Space is limited, advanced registration required. Online registration is closed; register by phone at 414-446-8794. Suitable for children ages 6 and up accompanied by an adult. Some tools only suitable for children ages 10 and up under adult supervision. Lynden is offering a series of holiday giftmaking workshops between November 22 and December 12. They range from simple activities suitable for families with smaller children to more advanced workshops for adults. To enhance the celebratory spirit, we will have light refreshments available for participants. Whether you are making a gift for yourself or another, these workshops should provide a cheerful atmosphere for art making as we head into winter. To see a complete list of holiday giftmaking workshops, visit our Workshops page. 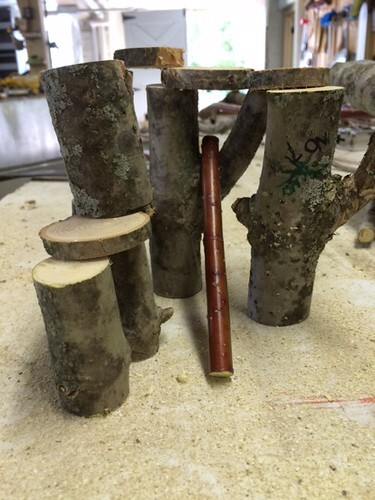 Make a set of tree building blocks for your young children. These blocks, made from locally harvested wood, provide a sensory activity for your children and enable them to practice balance and engineering skills. Andy Yencha, our land manager and wood artisan, and naturalist Naomi Cobb will guide you through the process from raw wood to finished block, and will help you create a container for your set.